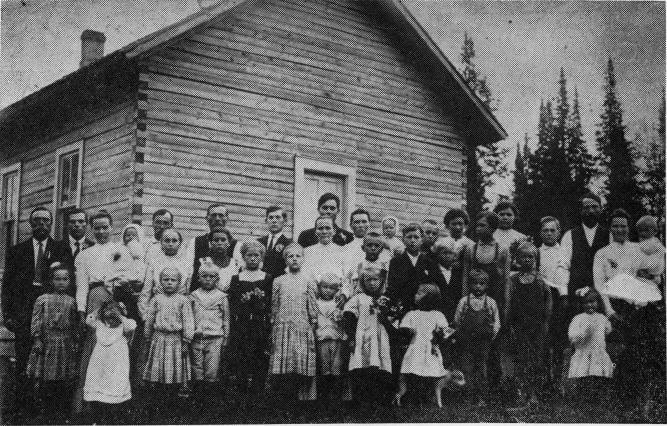 Toivola's first school. Pupils and parents. afield as Minneapolis, while newspapermen and photographers came from as far away as Chicago. LIFE (26 February 1940) devoted considerable space to the event. Finnish youth, of course, played the major role in this festival, as they have done and continue to do in Toivola's schools. The local 4-H programs are extensive; interest, high. The many prizes brought home from the township and county fairs every year indicate, perhaps, that Toivola will not soon be one of those communities that sees its farms abandoned once the older generation is gone. North of Toivola lies Little Swan, which the early Finns who lived there used to call `wolf country.' Finns began to move there soon after the settlement of Toivola began. According to William Mannila, the first homesteaders, arriving in the early years of this century, were Herman and Justiina Lammi, Otto and Olga Lindfors, Andrew Salimäki, John Lehto, John Ranta, Jack Helström, Jack Hill, John J. Hill, Jack Anttila, Eljas Harjulin, Matt Korpi. In 1956, Justiina Lammi, Olga Lindfors and Andrew Sali mäki were still among the living.